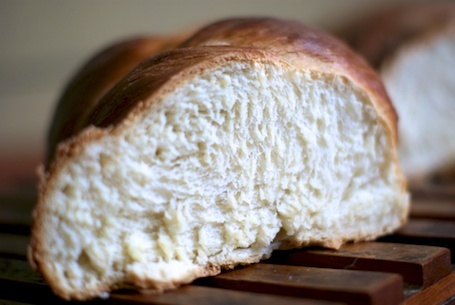 What’s better than a freshly baked loaf of Challah? 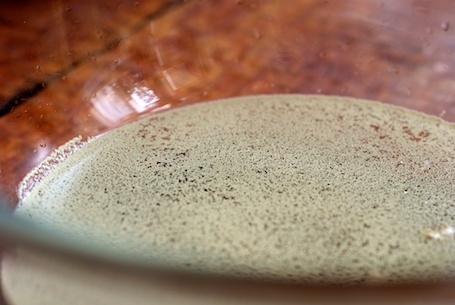 STEP 2: All yeast needs some kind of sugar to activate. 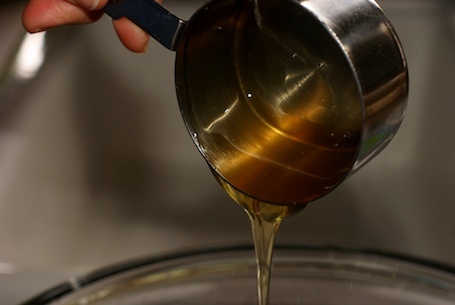 Feed your yeast 1/2 cup of honey for this recipe. 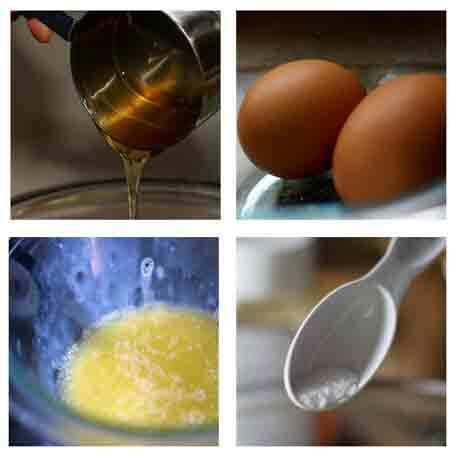 Mix it in with a wire whisk and then add the rest of the liquid ingredients: 2 room-temperature eggs (I like to beat them a bit before adding them) and 4 T. melted butter or oil. If you want a kosher challah, use oil, but I think the butter adds to the flavor. 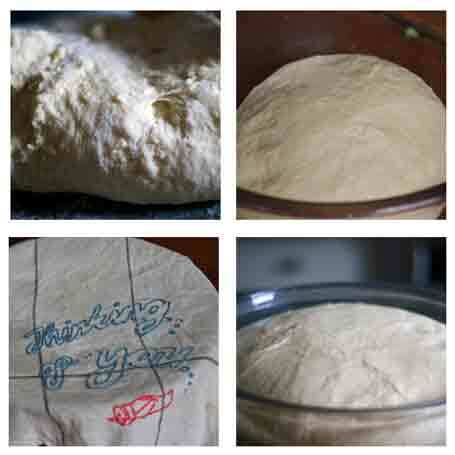 Just make sure it isn’t too hot when you add it or it may harm the yeast. Last but not least, a tablespoon of salt to help it along. 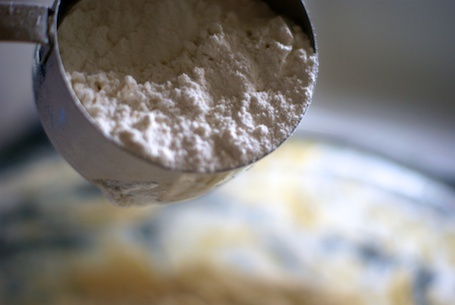 STEP 4: Knead dough for about 5 minutes, adding the last cup or two of flour as you go. 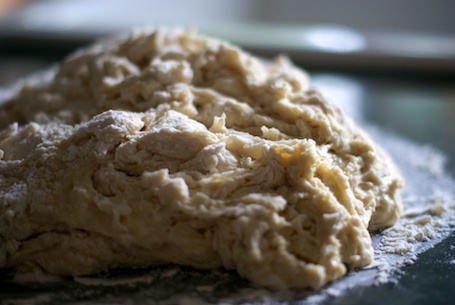 Once your dough is firm and not sticky, it will be ready to rise. 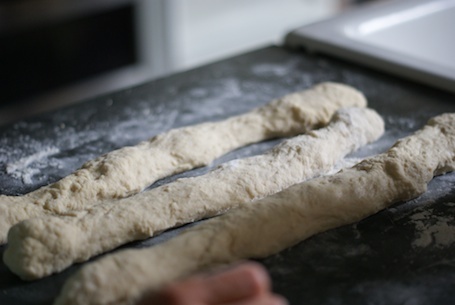 STEP 7: Knead for a few minutes and then cut into two halves. Knead each of those two halves for a few minutes, these will be your loaves. Take each half and divide it into three equal parts to make a basic braid. Roll each piece into a long snake, letting it rest awhile. STEP 8: Braiding. 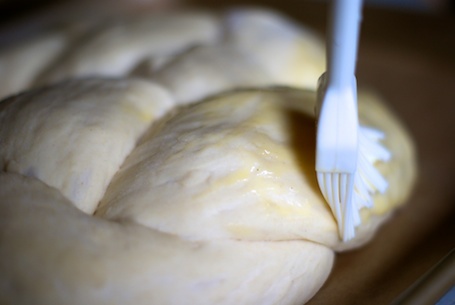 For this challah, we are doing a simple 3 part braid, but there are a bunch of fancy ways to shape your bread. For better directions on braiding, check out “The Secret of Challah” website (there are also a myriad of YouTube videos on this topic). 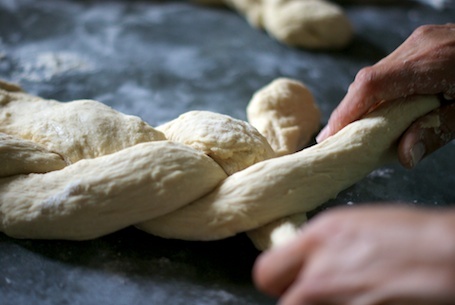 But suffice it to say that if you know how to braid hair, challah is no different. 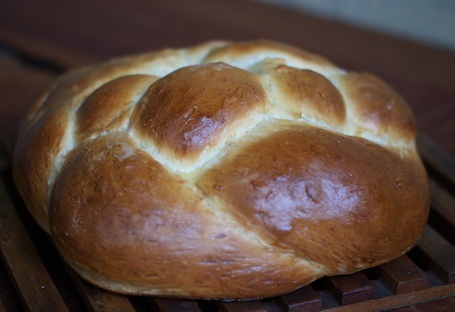 Normally, I just braid it into a simple loaf, but at Rosh Hashanah – the Jewish New Year – the custom is to shape your challah into a round loaf to symbolize the circle of life. STEP 9: Bake! Place your loaves in the oven. Set the timer for 15 minutes. At that point, take the half-baked loaves out and rotate them so the top is now on the bottom. Set the timer for another 20 minutes. 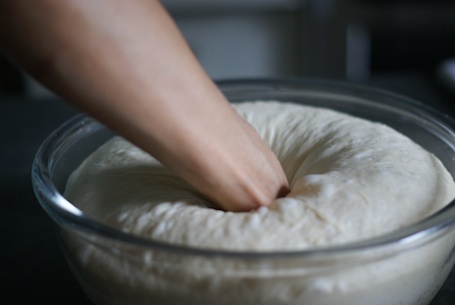 The bread is ready when the crust is hard and makes a hollow sound when you tap on it. Take it out of the oven and place it on a cooling rack for at least 30 agonizing minutes while you wait to slice it. Voilà! Time for the payoff. You have two loaves of warm bread – one to eat and one to give away. Take a slice, dip it in some honey and take a bite. At that moment, there really is nothing better than a freshly baked loaf of challah. 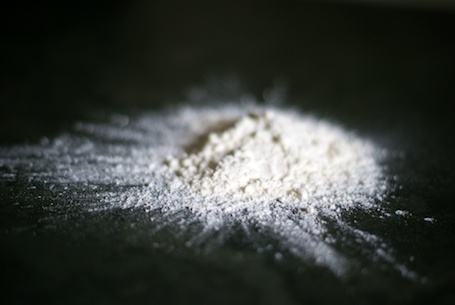 This entry was posted on October 2, 2011, 11:40 pm and is filed under Recipe. You can follow any responses to this entry through RSS 2.0. You can leave a response, or trackback from your own site.